People often don’t know when too much is too much because for them, too much is never enough. But let these hilarious pics show us what will happen if we make too much of anything. Living life with moderation is the way of the wise but is it really bad to overindulge in something? Is there a thing such as too much humor? We have gathered these hilarious pics of people who went overboard in their craziness and hilarity. Whether it’s a good thing or a bad thing, it’s up to you to decide. When the God of Cabbages bestows us with abundant blessings beyond our needs. This huge truck is breezing through even though it’s front tires are missing. True friends respond to your messages instantly. When a countless count of crimes aren’t enough to fit in a single headline. When you lack the skill to weld expansions on your car, you can just attach the extension like a trailer. Someone got the wrong idea on how to use a menstrual cup. That’s definitely not the way to use it. Are you a damsel in distress who is in need of a knight in cardboard armor to rescue you? This is the perfect embodiment of a self-indulgent in the most extravagant way. This ice cream is one tough nut to crack. Spoons are no match for it. Fortune cookies certainly know a lot better than us. Well, the government may be hiding something from the public but we’re still curious about Snowman’s favorite sport. Someone thinks he’s living in Antarctica when he’s actually living in North America. Even the coldest season in Antarctica doesn’t go that low. Sorry, dude. But Christmas Tree doesn’t look good on you. By the looks on your face, I think you already know. Traffic jam is a common sight in most cities but this is way too much. Well, what can you expect from the most populated country in the world? And when traffic lights suddenly failed, this particular street in China becomes a great debacle. 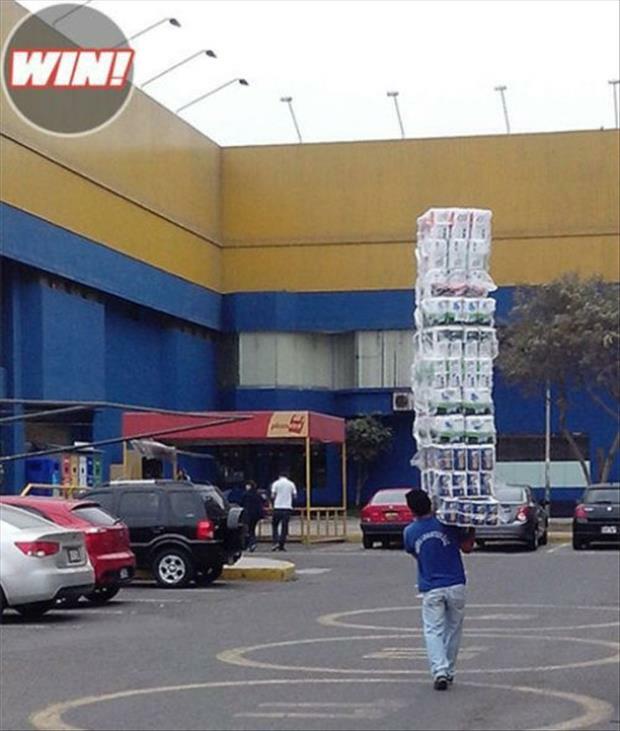 We’ll give this guy an A+ for his amazing balancing skill. Most of us can’t even handle 3 layers of those cans. Are they trying to communicate with aliens with these satellite dishes?